Insects which produce honeydew include planthoppers, leafhoppers, treehoppers, psyllids, whiteflies, aphids, scale insects and mealybugs – all ‘true bugs’ in the insect Order Hemiptera. 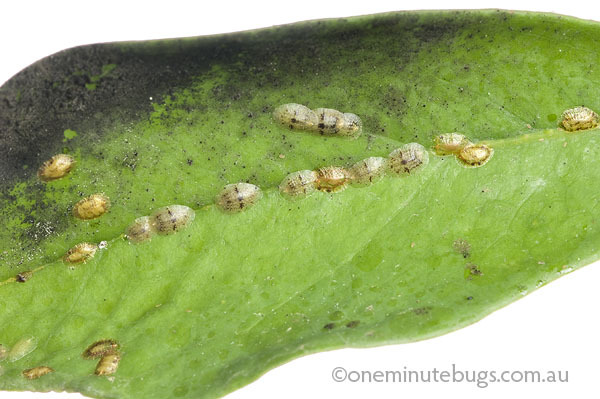 These bugs consume vast quantities of watery sap from which they extract the nutrients they require, particularly nutrients containing nitrogen. Many kinds of sugars are also present in plant sap in abundance, which are not required by the insects and are excreted in solution as honeydew. Almost all the dry weight of honeydew is in the form of sugars. It’s worth tasting honeydew to experience just how sugary it is. Many bugs propel the honeydew away from them so they don’t become trapped in the sticky stuff as it dries. The honeydew falls to foliage below, often in vast amounts when the insect colony is large. Wherever the honey dew falls sooty moulds may grow. 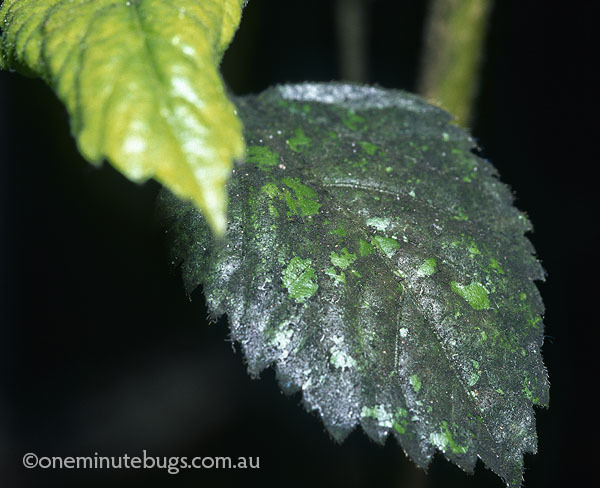 The hibiscus leaf covered in sooty mould pictured below was directly below a leaf (underside) covered in greenhouse whitefly (Trialeurodes vaporariorum). But not all bugs throw their honeydew away. Some psyllids allow their honeydew to harden into protective ‘lerps’ (you can read more about them here) while other sap-sucking insects use honeydew to attract ants which act as their bodyguards. Such interaction between bugs and ants is known as trophobiosis and is based on reward (sweet honeydew) for services rendered (protection from predators). The relationship can be specific and involve a single ant species and a single bug species, or one ant species may interact with several species of bugs, or vice versa. 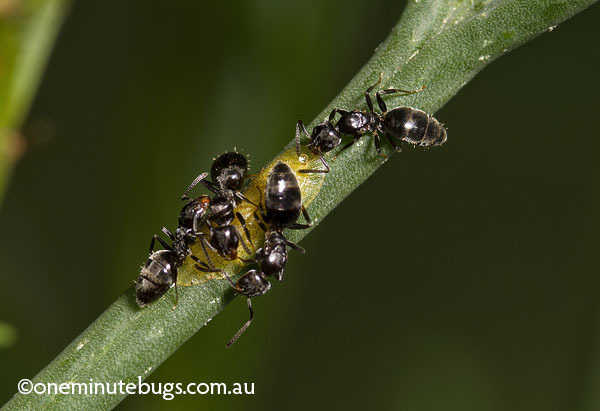 You don’t have to look far to find ants protecting honeydew producing bugs such as aphids, planthoppers and scale insects – almost any park, garden, orchard or nursery will be harbouring such a relationship somewhere. The picture below shows some ants attending soft brown scale, and you can even see a drop of honey dew. If ants are efficient at protecting the pest insects from predation such that pest numbers increase, ant control might be something you consider. For example, organic growers of citrus and other fruit have to use ant control as a means of controlling scale insects and other pests on their trees. To put it another way, controlling the ants gives predators and parasites a chance to control the pest insects. Ant control is simple – you can prevent the ants climbing a tree by banding the tree trunk with horticultural glue or some other sticky substance. 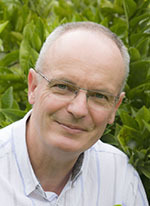 There are no fungicides registered against sooty mould – you must control the insect pests which produce the sticky honeydew on which the fungus grows. The fungus will stop growing once the honeydew source is removed, and will eventually dry out and fall off leaves, or it can be hosed off. This entry was posted in ant, Coccoidea, damage and tagged attendant ants, honeydew, sooty mold, sooty mould by denisjc. Bookmark the permalink.